Remember Oscar Wilde and Reading Jail ? Probably. The ballad too? Do you know who the Governor was while he was there? Probably not! Sir Evelyn Ruggles-Brise, that's who. And if ever you visit the village church in Finchingfield (Essex) you'll find a plaque to his memory, praising him for founding the Borstal system. When I was growing up in the 1960s, going to a borstal didn't seem much of a big deal. It was a sort of Approved-School add on; as much a natural progression through life as prep-school to public school to university is for many children in wealthy families. Maybe this was a local attitude and demonstrates little more than the kind of area I grew up in. Maybe the boys who were sent there took it more seriously than I did (I didn't know what happened to criminal girls) but I don't think they saw it quite as 'prison' - not like the Young Offenders Institutions we have now. This article on borstals points out that they were not necessarily humane places and says not to confuse them with 'approved schools' - which might more warrant the boarding school analogy. Certainly, I was surprised when I first saw the plaque in memory of Sir Evelyn Ruggles-Brise. To have invented Borstals didn't strike me at the time as something to be proud of. It's difficult, this. There are often contradictions between what is intended and what actually happens. (Just as Secondary Modern Schools weren't planned to be what they developed into.) Bravado has to be taken into account too. And, as time goes by, ideas change about what is harsh and what is helpful. This morning, I spent a pleasant hour rifling through the find-a-camp-site page of ukcampsite.co.uk which tells you where you can pitch your tent or park your tourer in England and Scotland. This afternoon, when preparing this post, I came across Her Majesty's Prison Service Find-a-Prison page. What a turn up! 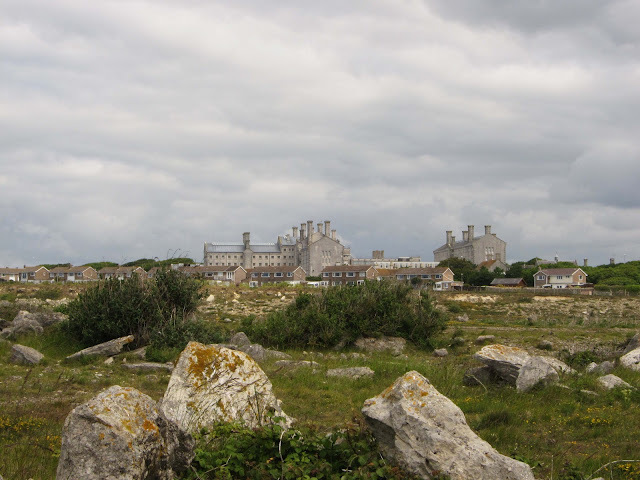 I was looking for information on the Grove YOI (Young Offenders Institution) on Portland in Dorset. Here's what it looks like across old quarry ground. Between 1848 and 1921, it was a 'convict prison'. Then it was a borstal until 1988 when it was changed into a YOI. It now houses 483 young men between eighteen and twenty-one. (2010.) Borstals no longer exist. They were abolished during the changes brought in with the Criminal Justice Acts and their revisions in the 1980s. Prisons are, of course, very different from what they were like in Oscar Wilde's time. None the less, I wonder what Sir Evelyn Ruggles-Brise would have made of this. His idea was that young people need something specially formulated for them. That doesn't seem unreasonable. Secondary schools are different from Universities and Universities are different from paid-work places. Different ages need different environments and levels of input. I don't know what it is like to live in an institution like this; nor what it feels like for families when they come to visit. It is a long way from nearly everywhere and must seem very remote. It's on a semi-island, joined to the rest of the country by a nine mile long bank of pebbles and by the causeway (which I described in a previous post). There are, of course, brilliant views from beside the prison . . .
. . . but for a young man used to the bustle of city life, I imagine emptiness must come as a bit of a shock. 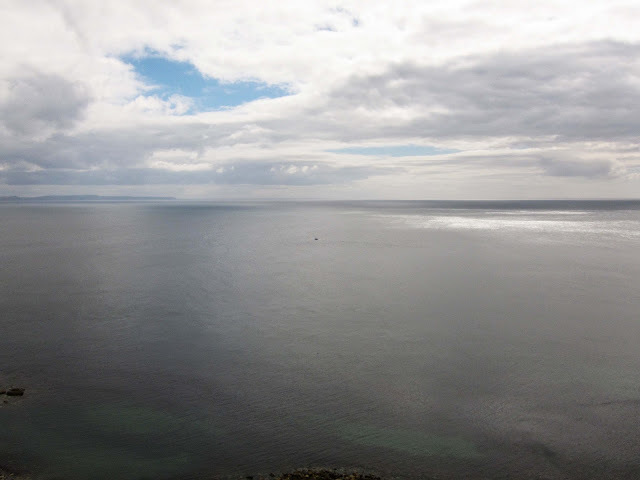 The sea can be as bleak as it is beautiful. Families who make the trek to visit must sometimes wonder if their sons and brothers have been sent to the end of the world. I have nothing to say here about what it's like inside the prison but I do know this is meant to be the beginning of a new life for the people locked inside it. The information on the find-a-prison page says it does not accept anyone whose sentence is longer than ten years. Ten years is a long time - some of the young men here may have committed pretty serious crimes. But whatever they have done (and some, I would guess, in the scale of criminality - not a lot) this will be their home for a while and . . . we are getting to the point . . . most readers of Loose and Leafy will have an idea that what grows around our homes profoundly affects what goes on in our lives. 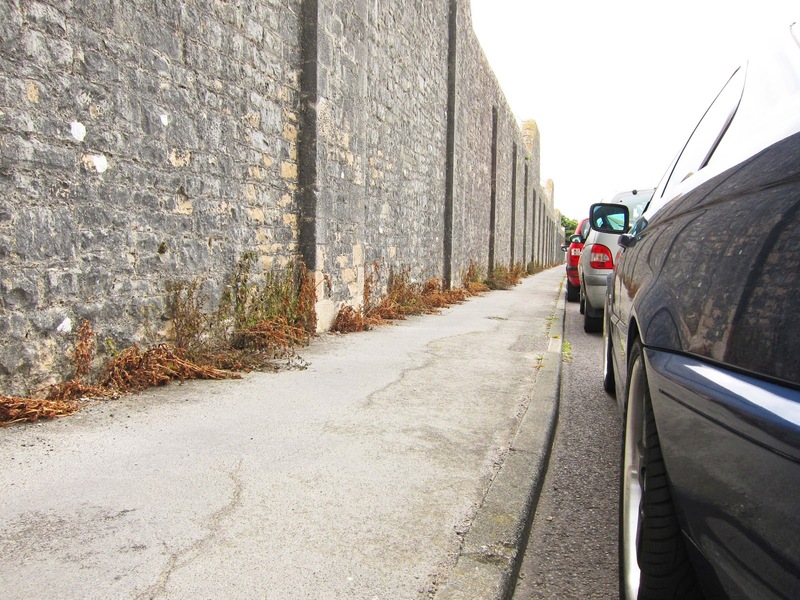 This was the scene yesterday (May 27th 2011) when I walked along the prison wall. As you will know from previous posts, I do not recognise the conventional distinction between weeds and the wild plants of the streets. Some young men are allowed 'out' to help in a community garden. Could they not have been asked to pull out these plants? To do a bit of light weeding? Clearly not. Someone has been the length of the wall (and this is only part of it) with poison. This is what you see when you arrive - a high wall and a great line of dead plants. People arriving in prison vans won't have time to look up, except perhaps to glimpse the razor wire. 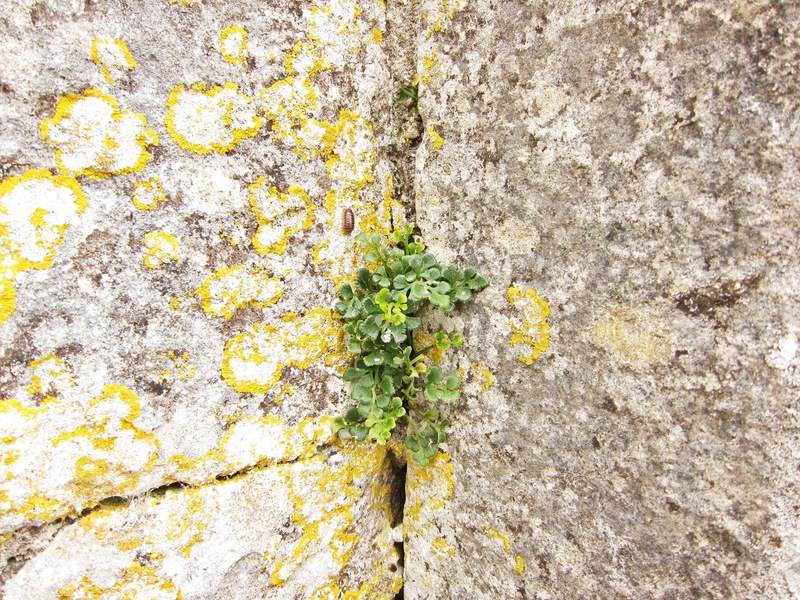 But those of us at liberty to stop, will see plants, not many of them, but plants, gripping into the crevices between the stones. And the lichens and woodlice and clumps of leaves lower down. So far, no-one has killed the plants along the more recently built bank which holds up a lawn nearer the prison gates. Did they leave these bits of grass and barley because there is a poppy - or is the poppy on the list for next week's weedkiller? This is not a post about how young people should be treated when they break the law. It is post that says what we see has an impact on how we are; that seeing dead vegetation is unlikely to be an inspiration to live a better life or to put your trust in the people who will be caring for you (guarding you!) over the months to come; that killing plants without need is . . . well, I think it is wrong. Maybe the Young Offenders could be introduced to growing their own veg? I'm sure it would be therapeutic. Hello Mark, for some of them, that is, indeed, beginning to happen - they have a vegetable patch in the community garden mentioned. What kind of example is using weedkiller to people just starting to learn how to grow things? Oh, the dead plants, be they useful or otherwise, should not have died like that, it looks dreadful. Your first picture is so evocative and the atmospheric nature of it is marvellous. The last shot is also marvellous, so many species of plant in that small area. 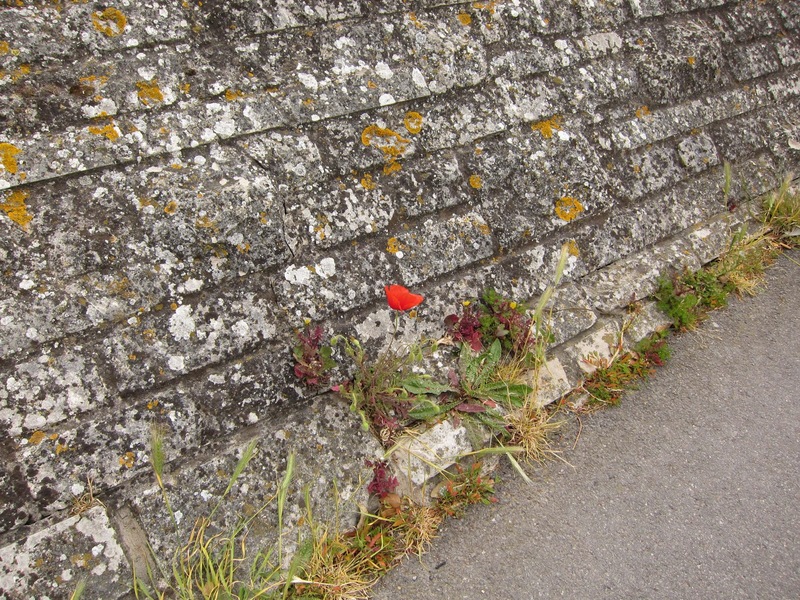 I hope the Poppy remains and, too, the Lichens and Mosses. Hello Toffeeapple - There are lots of people who notice only whether a place is neat or untidy and miss the variety and beauty of what is there. All the same, you'd have thought everyone would find a great row of dead brown plants less sightly than green 'weeds'. There is an AWFUL lot of 'everyone' who sees the dead plants as tidied up, someone 'cares'. They never saw a flower was there, a poppy. Our Agent Orange neighbours have a few inches of green velvet, that they haven't noticed yet. It would be good if they tidied up the dead plants. Hopefully there's a bit more life and stimulation on the inside. The building with all its chimneys and windows is a little like how I imagine the castle of Gormenghast. I do hope they leave the poppy - there are few more depressing sites that dead foliage in an already grey concreted environment. Very interesting article and good timing as well. Hubby and I have been on a campaign to watch all the old British serials we can find on netflixs and the last one was about a family living in a debtors prison before they were outlawed. That is a very uninspiring and bleak picture where the plants have been poisoned, they could at least have hoed off the dead top growth. Much better to have left the grass and 'weeds' to give a little life and colour to a grim place. The poppy gives a real lift to the spirit with that vibrant burst of colour. Hi Lucy - I remember this institution from a walk round Portland Bill. Boarding school was hard enough so hearts must sink when they see this for the first time. A very philosophical post which rightly lays bare the all too common woeful attitude to weeds, as parallel. Lucy, this was a great read for me. All my life I have been interested in prisions and the people that are placed there or working there. It would be nice to see those weeds gone. I am guessing that they can't let the offenders out to do just that, for unknown reasons to us. Very interesting wall with cracks, and the grounds with rocks, then the institution that has those dark clouds overhead. It is depressing to live in overcast for me, and now I wonder how it was for people there. Thanks for the history lesson. Just wanted to say hi. Love the lighthouse post. Hurray, Diana, for your poppy and weed transferring! Hello Damo. I know nothing about life on the inside but I doubt it's much fun. I hope there are good things. Hello Kitty. I tried to read Gormenghast once but didn't get along with it very well and gave up part way through. I do think this is a beautiful building though, for all that it is stark. You can see it from a long way off. Probably not so lovely on the inside - but I'm horribly ignorant. Hello Rita. I don't know that The Grove was ever a debtors' prison. The word 'convicts' suggests more criminal-crimes. It's awful this - I really don't know. 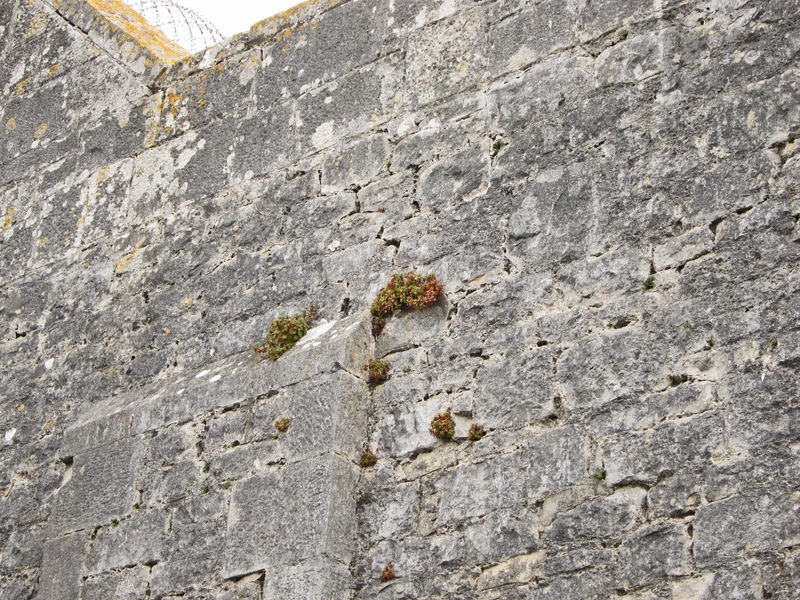 I saw the prison, saw the plants, wrote the post! Hello Rowan. I expect to be passing that way again soon. I'll look to see whether the plants were left or pulled out. Hello Patio Patch. Thank you for making that parallel between the young men inside the prison and the plants outside it. It sets off a whole train of extra thoughts . . .
Hello Janie. Your comments (and those of others) make me realise I should know more about what happens at The Grove. Not sure how I can educate myself. I don't know what sort of reception I'd get if I phoned and asked what life is like inside. Hello Ciny - hi! I'm glad you liked the Lighthouse post. Thanks for letting me know. You might like to know I've just posted a post about what it is like along the cliffs by The Grove Prison. 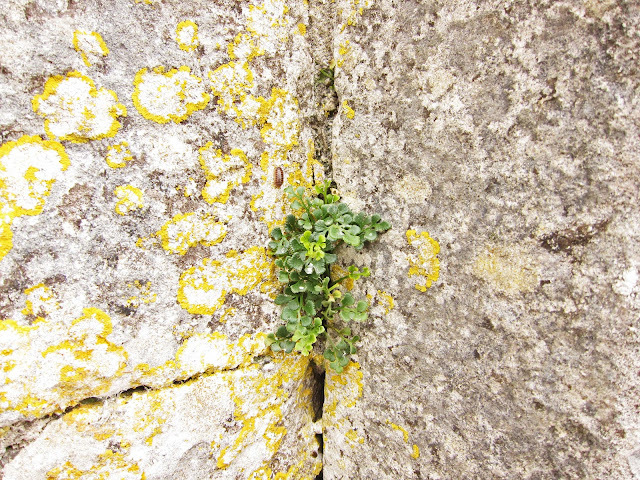 It's part of a series in which I give a context for the plants on this blog.